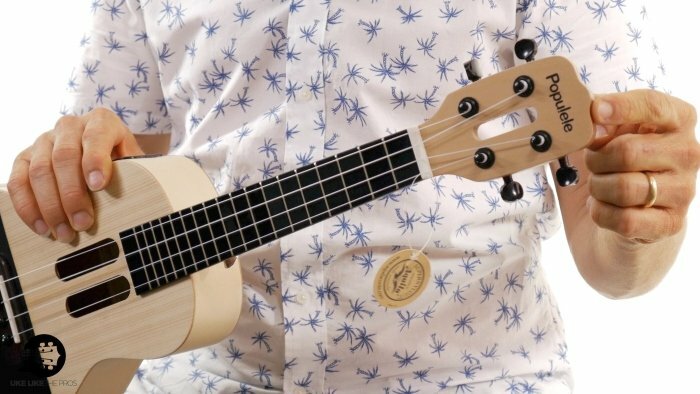 I was asked to review the Xiaomi Populele U1 ukulele by Popuband. 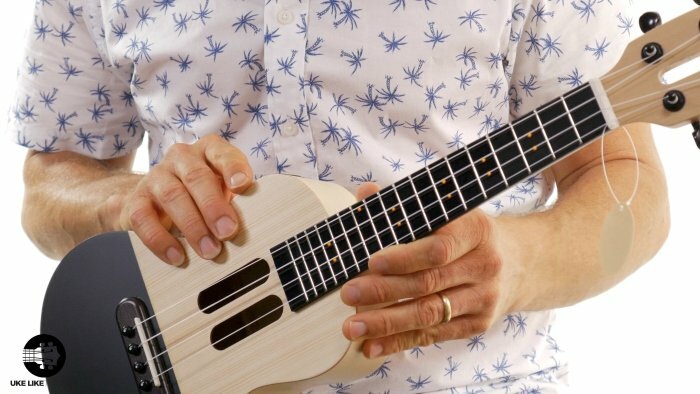 Most of the reviews I have done in the past have been with KoAloha Ukuleles so I was excited to jump into a ukulele that is more geared toward the beginning ukulele player. 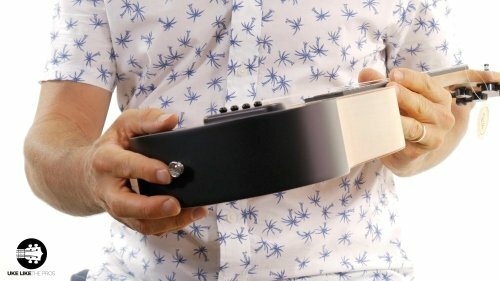 The Populele U1 is considered “the world’s first smart ukulele.” Honestly I didn’t even know what “smart ukulele” meant but after spending some time with this instrument, I figured it out and will share what I learned below. Awarded as Editor’s Choice, the Xiaomi Populele U1 is a great choice for both beginners and intermediate players. When the Populele box first arrived, I was impressed with the presentation. It had a nice sturdy box which held the ukulele and some goodies including a canvas case, extra strings, picks, capo, and a USB chord. At first look, the Populele definitely stands out with the bottom half of the ukulele painted black and the unique looking sound holes. When I grabbed the ukulele, it felt solid and well put together. 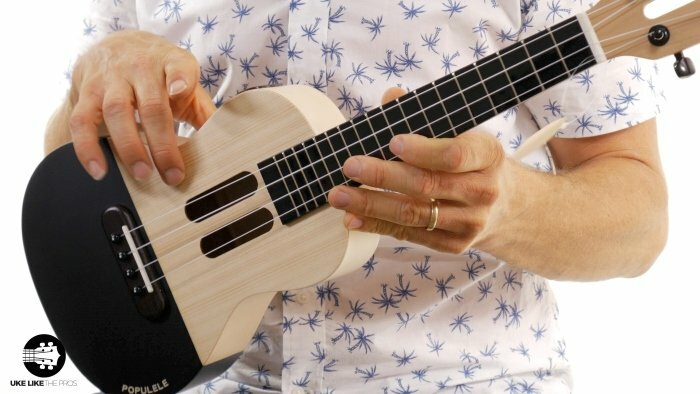 The Populele is a concert size ukulele and comes with a high G. The Popuband website claims that the sound board (the top of the ukulele) is premium spruce wood. To me it looks like a plywood with a spruce top laminate on the top. The back and sides of the ukulele appear to be a laminate as well. The neck seems like it’s the most solid part of the ukulele, the website says the neck is European Maple and is a nice piece of wood. The neck has a satin finish which is nice for playing, but the neck is a bit thicker than I would prefer. The headstock also has a unique look with the hole in it that matches the sound holes. The tuners seem nice and turn smoothly. The fretboard is black plastic which somewhat surprised me, but I soon realized that part of what makes this a smart ukulele is that the fretboard lights up, which explains the plastic. I like that it comes with a front and back strap buttons so you can play with a strap. Playing with a strap is something I find useful and important to do. The ukulele also comes with Aquila strings. After playing the ukulele and doing some strumming and fingerpicking I noticed the action (the height of the strings off the fretboard) was good and it played pretty well. The sound is thinner and doesn’t sustain as long as I like which is probably due to the wood and the plastic on the fretboard. 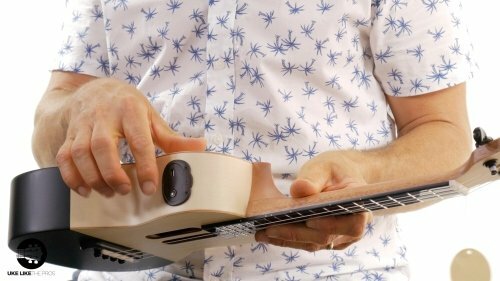 Another thing that makes the Populele a smart ukulele is the USB Bluetooth device located on the side of the instrument. 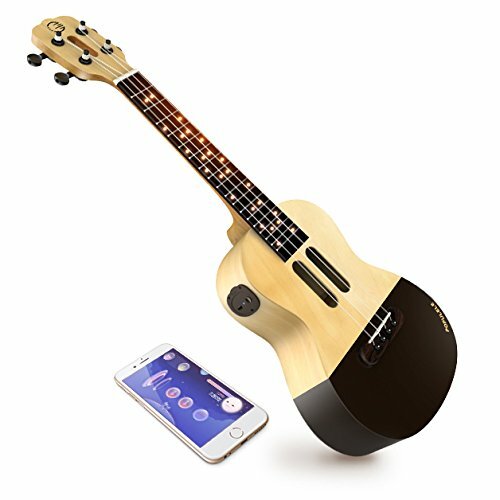 The USB is used to charge the ukulele and the Bluetooth is used to connect with the Populele App. 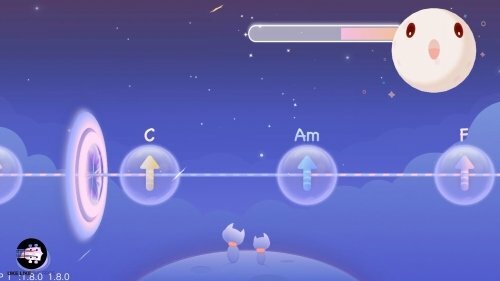 The app connected to the Populele easily and is filled with instructional tips, videos, and games to help you tune, learn chords, rhythm, and play songs. I think the app is where the Populele shines and why it’s called a smart ukulele. When I was tuning, the fretboard lights up with the string you are supposed to play. Also, when you are learning chords the fretboard lights up showing you where to place your fingers. 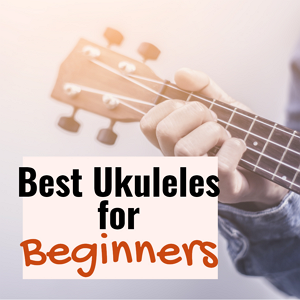 Although looking over the ukulele neck to see the lights does seem a little cumbersome, it is a useful tool for a beginner. The app also contains a large song library of songs from artists such as Adele, Maroon 5, Jason Mraz, Michael Jackson, and many others. When you pick a song the first screen shows you all the chords in the song, along with chord diagrams and the strum pattern. Once you hit play a backing track plays along with the melody as the chords scroll up the screen guiding you along. The lyrics also show up on the screen to help you keep your place. I played “Billie Jean” by Michael Jackson and “Someone Like You” by Adele. My overall review of the Populele U1 is that is that for around $129-$189 it’s a solidly build ukulele, that has a unique look and a decent sound. Although it’s not going to sound like a Koa wood ukulele your also not going to be paying the price of a Koa ukulele. The strengths of the Populele is the well-built neck and the usefulness of the Populele app. Although the app will work with any ukulele, you only get the functionality of the fretboard lighting up on the Populele. If you like learning through games, then the app can be a fun and visual way to learn. 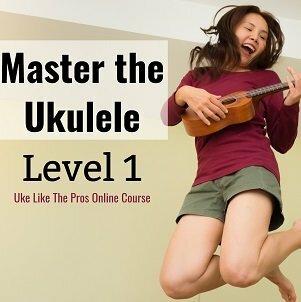 I think for under $200 you get a lot with the Populele U1 ukulele and can be a good learning tool for a beginning ukulele player.